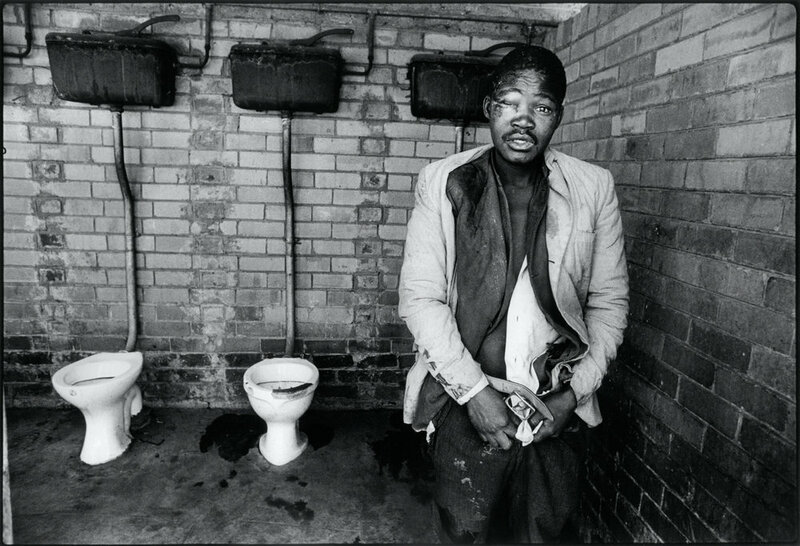 A mine worker in the men’s lavatories in Soweto, (South Western Township) Johannesburg, South Africa, after being beaten up and robbed. 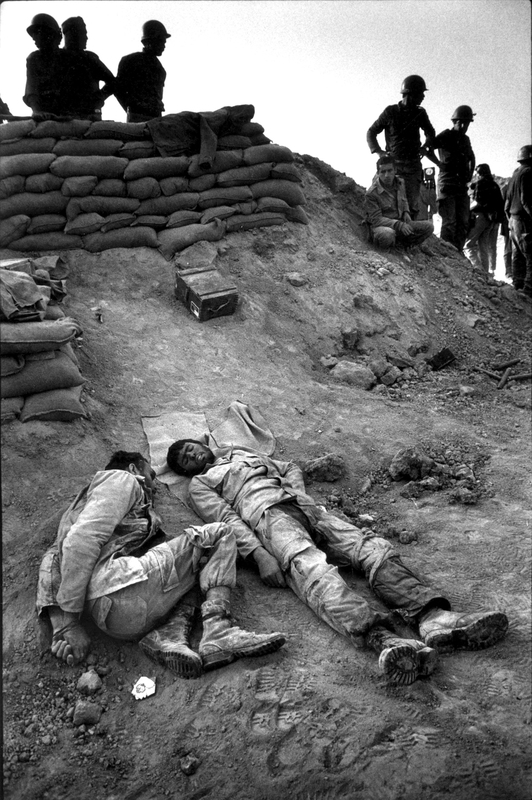 Wounded Iranian prisoners captured during trench warfare near Basra. Iran/Iraq war in 1982. Post Zimbabwe independence, government troops quell the uprising of soldiers and supporters of the opposition party, ZAPU, 1981. Wounded liberation fighters in a hospital near Hargeisa, Northern Somalia after fighting with Ethiopian troops. ZANLA (Zimbabwe African National Army) guerrillas killed in Rhodesian War of Independence and one survivor near the town of Mount Darwin, Rhodesia (Zimbabwe). Two women thought to be helping Zanla Guerillas being held at a road block close to Salisbury (Harare) in Rhodesia, 1976. 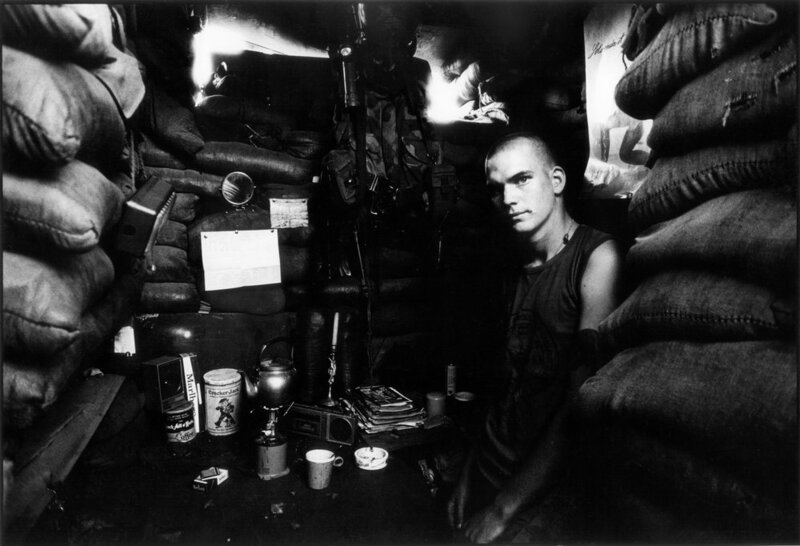 A US Marine Sniper in his sandbagged hideout at Beirut airport, Lebanon, 1983. An off duty US Marine on board the USS New Jersey battleship, off the coast of Lebanon during fighting in 1983. Colonel Gaddafi during a rally in Tripoli 1986. U.S.Troop re-enforcements dispatched off the coast of Lebanon, 1983. Pakistani soldiers training at military barracks in Abbottabad, Pakistan. Russian troops on training exercises in Poland during cold war. Portrait of Saddam Hussein shot during a Time Magazine interview at his palace in Baghdad, Iraq, 1982. Kuwait port, cargo ship listing, and hulls of others lit by the oil fires raging in the desert after the defeat of Iraqi forces, 1991. A resistance fighter in fox hole in the aftermath of the war with Iraq in Kuwait, 1991. A resistance fighter in the aftermath of the Gulf war Kuwait, 1991. 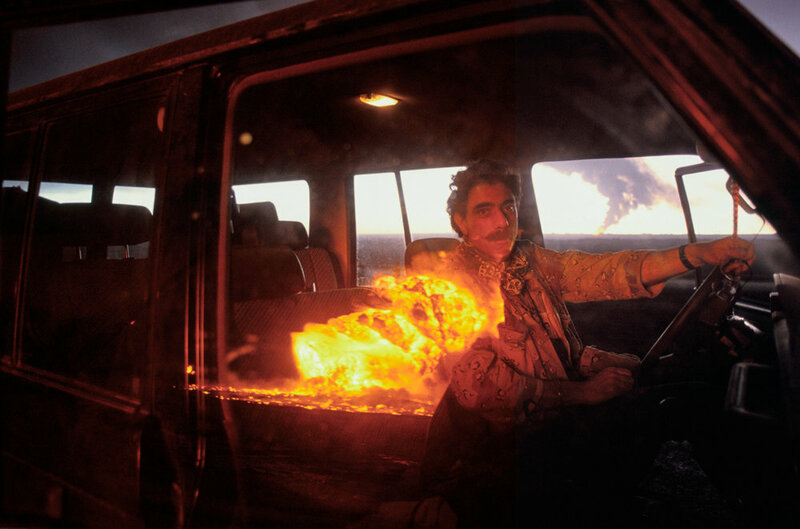 Photo Journalist Alan Tannenbaum in jeep during Gulf War surrounded by oil fires in 1991. Polish steel worker Katowice, 1989. Twin steam engine push-pull train through the Kyber pass, 1982. Peruvian gold panners make their way through Laberinto to their camp in the Amazon Basin, 1990. Peruvian gold panners working in the Amazon Basin, 1990. 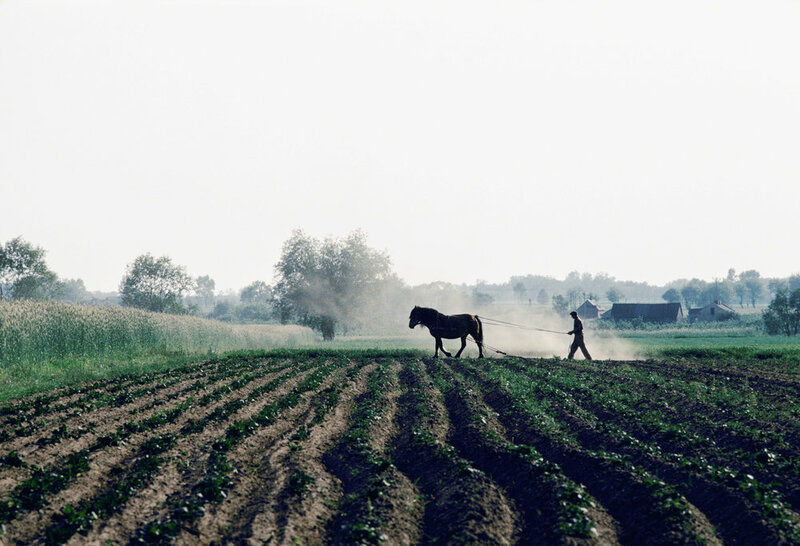 Farmer with horse drawn Plough during communist rule in Poland. ‘Mother of Peace Community a charity for orphaned children during the aids epidemic at Mutoko, Zimbabwe. 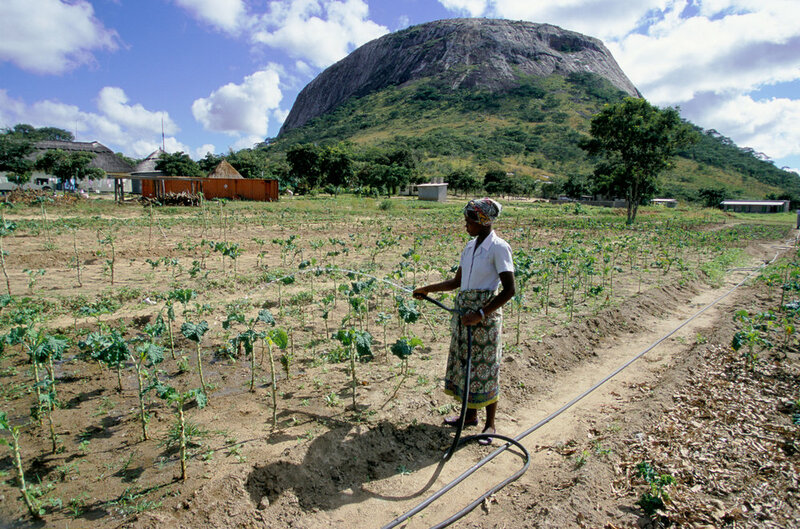 A young woman watering her vegetables, 1999. ‘Mother of Peace Community’: Mutoko, Zimbabwe. A blind orphan, Steven, with Piwai, one of the nurses at the mission, 1999. A young woman carrying water in a basin on her head, Nigeria. Zimbabweans occupy white owned farms in 1999. 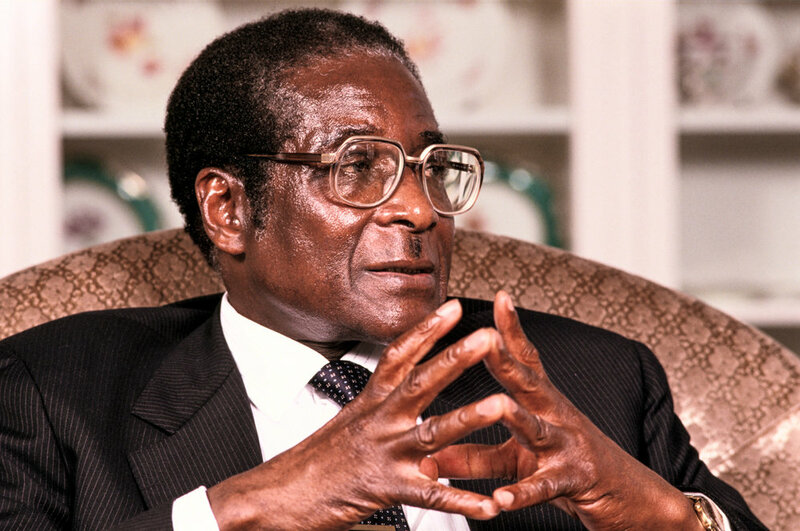 Robert Mugabe, Zimbabwe politician, on his 66th birthday. People holding hands at the front of the crowd at a solidarity rally in Poland, 1989. Hungarian children cycling at the border town of Koszeg inside the ‘Iron Curtain’ in 1989. Children walk with donkeys past a sunbather on Blackpool beach, UK. Rockers in tribal England, London 1982. South African author Alan Paton at his home, Durban, South Africa, 1981. A portrait of British pop singer, Sade. For cover of Time Magazine 1986. British Prime Minister Margaret Thatcher in a tank taken in Germany while promoting British arms. US President Ronald Reagan with Margaret Thatcher in Downing Street in front of Portrait of Winston Churchill. Margret Thatcher standing in front of the British Flag during the her election campaign, 1983. A portrait of Margret Thatcher during a Tory Party Conference, London, UK, 1990. 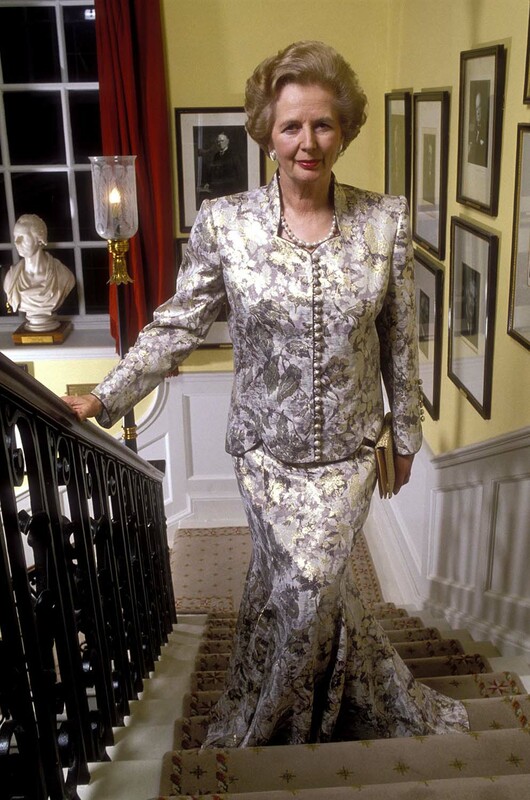 Prime Minister Margret Thatcher posing on the staircase of 10 Downing Street in a evening dress, in 1988. Steve Biko’s body in his coffin surrounded by his family at his house. He was killed while in Police custody in Pretoria South Africa, 1977. Mourners holding wreaths and posters of Black conscious leader Steve Biko at his funeral in Grahamstown, South Africa. Steve Biko’s coffin being carried passed thousands of mourners the day he was buried, 1977. Dame Thora Hird shortly before she died. A Steam train derailed by a bomb during the war of Independence in Mozambique, 1974. Jubilant crowds in Harare when President Robert Mugabe became the first leader of independent Zimbabwe, (formally Rhodesia) in 1981. Bull fighters of a sort on Sunday afternoon in Managua, Nicaragua 1986. Camel herder has a bath in the water trough, Berbera, Somalia 1979. Zimbabwean smoking a homemade pipe, 1973. 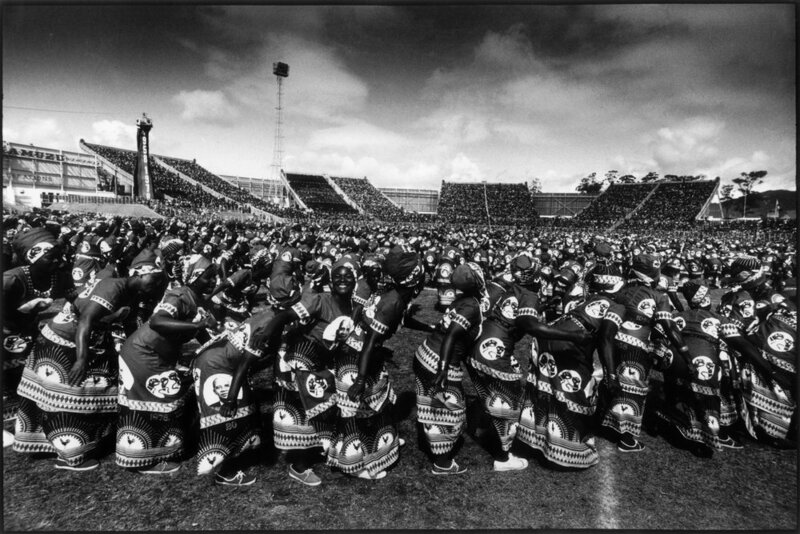 Celebrating 20 years of Independence, women dance wearing clothes with a portrait of President Banda printed on them, in Malawi, Africa, 1978. School children rioting during the Soweto riots in 1976. Hundreds were shot dead by the police. A boy selling charcoal in Managua, Nicaragua in 1987. This image was the first prize World Press Photo for ‘daily life’ in 1988.